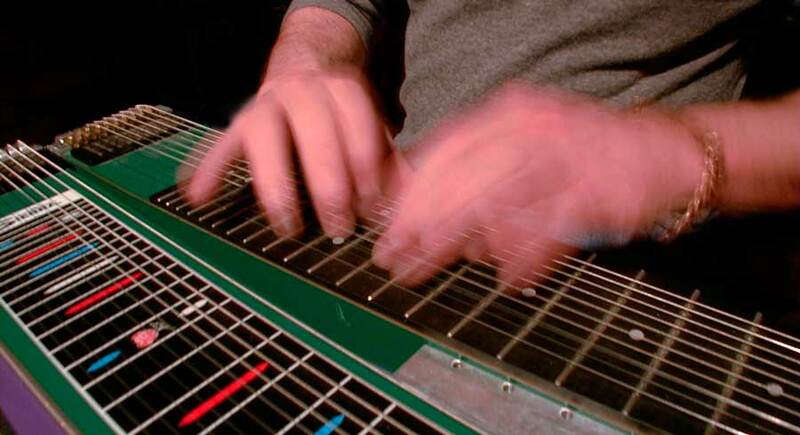 The Tapper is a pedal steel guitar with a raised fretboard that can be fretted with the fingers instead of a steel bar and the strings can be raised or lowered with the pedals and knee levers. Making use of the "tapping technique" works great on this innovation. Others like Paul Franklin, Gene Fields and Zane King have eperimented with the fretboard pedal steel guitar, but none has tapped it this way. Zane King is very talented with this approach to the fretboard steel guitar. Sometime in the early 90's I met Ned Steinberger in a club in Nashville and I was able to instigate a meeting of Ned and Buddy Emmons at Buddy's house in Nashville in the early 1990's At some point during this time, Ned visited with Don Christensen and Tom Baker at the Sierra Instrument Company In Portland, Oregon which resulted in the Tapper being produced for me which can be heard on this record. The Tapper Proto-type was completed for me on Jan 17, 1994 and a double neck guitar (11 string pedal steel with a 10 string Tapper neck) was completed for me on June 1, 1996. Buddy Emmons has provided me with so much inspiration as well as Regi Wooten.